Here begins my official, extensive chronicle of my fantastic visit to The Edward Gorey House yesterday. I have so many photos to share with you that I think I'll need to break it up into multiple posts. 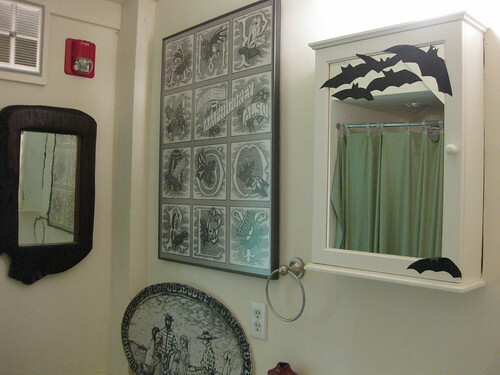 If you want to see the whole slew of photos, though, hop on over to my full Edward Gorey House photo set on Flickr. So above, you see me posing with the fantastic, dapper front door cat. This is the actual front door of 8 Strawberry Lane, but now you enter and exit the house/museum through the side door (aka gift shop). 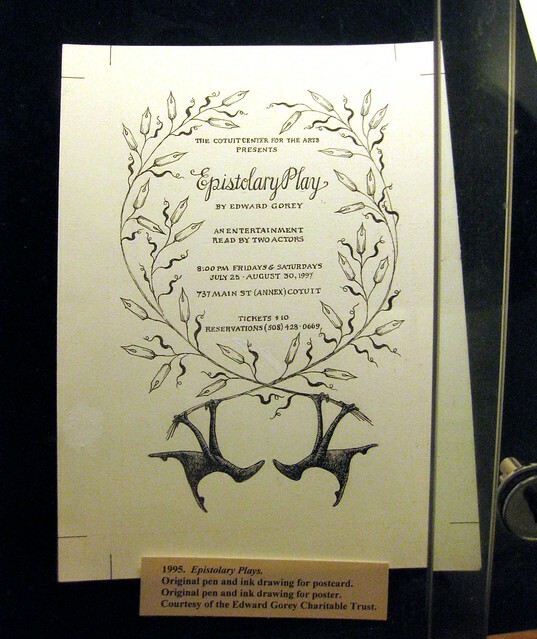 The current exhibit is what got me off my duff to finally visit the Gorey House: Edward Gorey's Envelope Art!! Most unfortunately, the Gorey House allows non-flash photography everywhere BUT the current featured exhibit. So, alas, the items I most wanted to photograph were strictly forbidden. Words do not describe the utter amazingness of the envelopes on display - originals, in Gorey's own hand, through the mail with their old stamps and postmarks and all - so if you are at all able to make it to the museum to see them, I cannot recommend it highly enough. (It runs through December 2012.) Many of the envelopes were featured in the recent book, Floating Worlds: The Letters of Edward Gorey & Peter F. Neumeyer, and I hear that book is wonderful. I'd like to get it. But quite a few of the envelopes were to many different people (including delightful ones to Gorey's mother), and I don't know if those feature in the book or not. I somehow think not. Anyway, the image above, a reproduction on a sign outside, was the only "envelope" I got to photograph. Some cool things were in the special display room, too, and photos weren't allowed anywhere in there. So I couldn't take photos of photos of Gorey snuggling with his own cats, or his original "I love cats" artwork, complete with cat, or of the typewriter by that mantle. But oh well. All the more reason to entice you to the museum yourself. I escaped the tour to do so; we got there right at opening, and jumped into a very large tour that had just begun. Full disclosure: I did not care for the tour and only shadowed it. My best beloved and I struck out on our own, reading placards and exploring at our own pace. I heard bits from the tour, but not only was I put off by the size of the tour - the rooms were small, and not everyone in the tour group could even fit inside the room being toured - but I was not enamored of the tour guide. You know how it is. Sometimes you just don't click with 'em. Nothing personal. Epistolary Play!! I confess I'd never even heard of this, but how I would have loved to have seen it! I was bummed that the gift shop didn't have any of the postcards, but oh well. How awesome is the tree of pen nibs?? 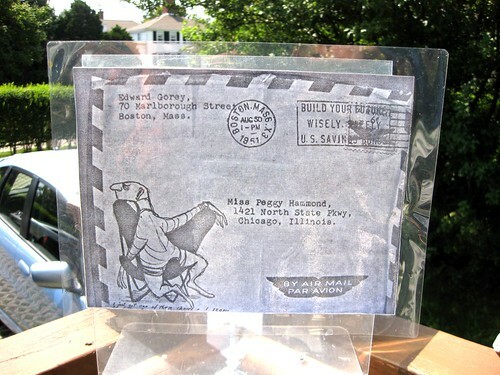 In my Edward Gorey House Flickr photo set, there's also another great photo in this vein of a bouquet of pen nibs for Epistolary Play. 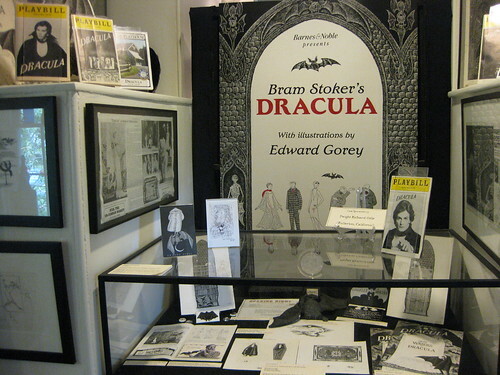 In the area that used to be the main front staircase of the house, there is now a display of Gorey's fantastic involvement in the 1977 Broadway staging of Bram Stoker's Dracula. Gorey designed both the costumes and the sets. He was nominated for Tony awards for both, and won the Tony for Best Costume Design. I somehow managed NOT to get a good photo of the Tony itself. Because this is so extensive and photo-heavy, I'm going to break this up into multiple parts. Ready for more? 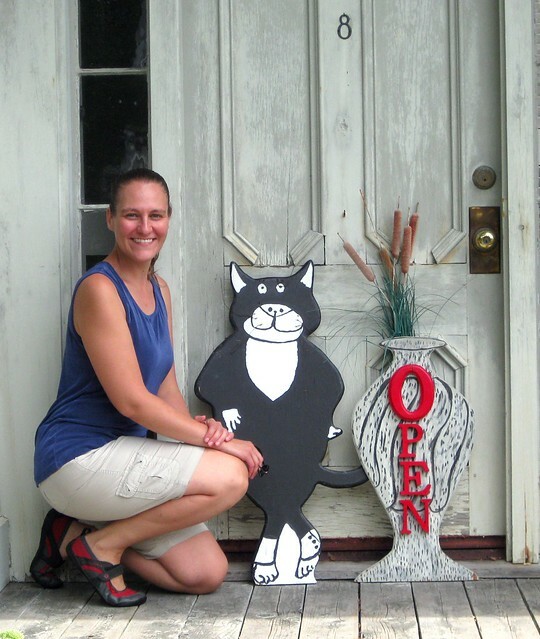 Voila - Edward Gorey House visit: Part 2! I remember Edward Gorey's stories being a lot more 'out and about' when I was a child. It's sad that so many kids don't know about him. I did buy the book Floating Worlds. It was very interesting. The drawings are fabulous, but are only those drawings on envelopes sent to Peter Neumeyer. However, you get to kind of know Edward Gorey through his letters/relationship with Peter, and for that I recommend the book! Not as many drawings as I was hoping for, but you do get to see some of the notes and letters in Gorey's own handwriting. It's so great that you got to visit the House!